We have received a few calls about the night-time lights being off on the large billboard along Frazier Mountain Park Road. We are aware of the problem, and would like to explain the issue. Unfortunately, this problem isn't as simple as redirecting a light or replacing a battery. The entire solar panel was stolen. The criminal had to go to some trouble, since the panel was at least 12 feet off the ground on the side of the billboard. The cost to replace it is the same as our insurance deductible, so the board of directors has opted to raise the money for replacement rather than making an insurance claim. 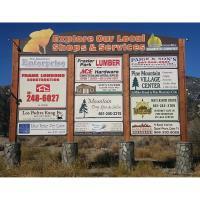 We also need to raise funds for the replacement of several solar batteries on the signs leading from Lebec to Frazier Park. We are not a government entity supported by tax dollars. Our only sources of income are membership dues and small fundraisers, so raising this money may take a little time. We truly hope that there are more business owners who would like to join the Chamber so we can accomplish our mission and take care of the community's assets together. After all, we’d be able to accomplish a lot more if a lot more businesses came on board! It’s really easy to remain uninvolved, but it’s much more fun to be a positive force and work toward some amazing goals for our community. All we need is 10 new members at the Adventurer membership level and the solar panel is paid for! Can we get there together? Or if you are a member who can help us get the panel or batteries at a discount, please let us know! That would be a big help. By the way, a membership investment in your business is a great value. Not only does the Chamber give you valuable tools and resources, a study by the Schapiro Group showed that 63% of respondents were more likely to want to purchase goods or services from a small business that is a chamber member. A lot of our members have built their businesses by being involved and using the resources that we make available. If you're interested in joining the Chamber of Commerce and helping us replace that solar panel and old batteries, you can learn more about our different membership plans and join online here. You can also reach us at 661-245-1212 or by email with any questions. Any of our board members would love to talk with you more about how we are working to support your business, nonprofit, or religious organization.